Postmark Letter Opener Model 3056 - Technology Unlimited, Inc.Technology Unlimited, Inc. 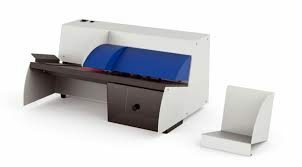 The Postmark 3056 letter opener is heavy duty and highly productive opening up to 24,000 envelopes per hour. The Postmark protects the contents from being cut or damaged. The Postmark 3056 removes from 0 to 3mm (1/8 inch) of the envelope edge. The sliced material are deposited in the waste compartment. The Postmark 3056 will allow to stack approximately 100 envelopes at a time in the feeder. The 3056 creates a soft, feathered edge opening, which prevents paper cuts and gives easy access to the contents.